This deck looks to create a monstrous horde of creatures and tokens, and then lock down the board with huge protection spells like Privileged Position, Avacyn, Angel of Hope, and Shalai herself. 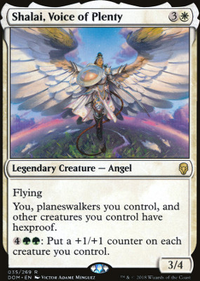 With Anointed Procession, Ajani's Welcome, Anointer Priest, the deck's main goal is to swarm the board, pump up everyone, and smash face for the win. The deck also looks to stop other decks, mainly hard aggro decks, from smashing into me in retaliation. Authority of the Consuls and Blind Obedience slows down creatures for a turn, while Ghostly Prison, Baird, Steward of Argive, and Sphere of Safety will help to keep me safe.